Two years ago we wanted to quit having to mow between our blueberry bushes. We laid down landscape cloth, covered it with sawdust, and our mowing days were behind us. 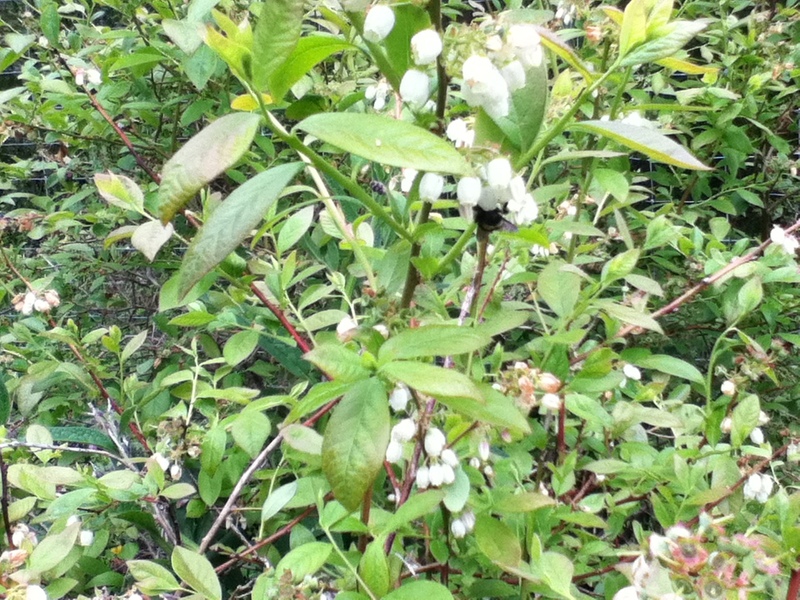 That year we watched the bees pollinate the blossoms and the berries grew like never before. We had a huge berry crop but couldn’t eat a single berry because as they ripened, a family of robins spotted them first…each bush was clearly visible from a bird’s eye view and as the berries ripened, the birds easily picked them off before we could. We laid fake snakes on the ground. We hung shiny wind socks to distract them. We thought about netting them, but it would have been difficult to pick them. So we let the birds have them. Last year we tried a different strategy. We let the comfrey that we had been treating as weeds, grow up next to the bushes. We didn’t have any bird problems. So this year we’re doing the same thing. The comfrey provides blossoms to attract the bees which pollinate both the blueberries and the comfrey and we are assured of having berries without birds. 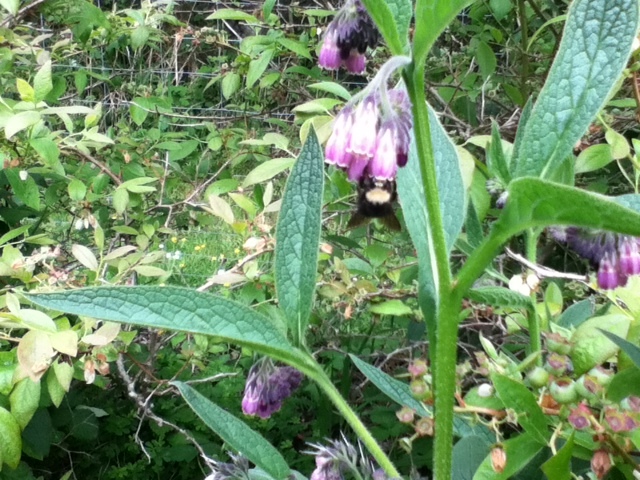 Bumblebee pollinating Comfrey blossoms. 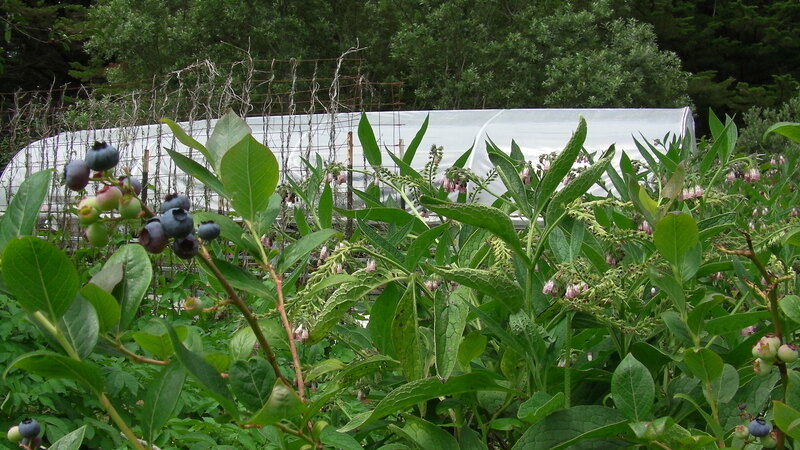 The bees work both the comfrey and the blueberry bushes that the comfrey hides from the birds. The comfrey is still blooming!! It’s been over two months since the first picture was taken. 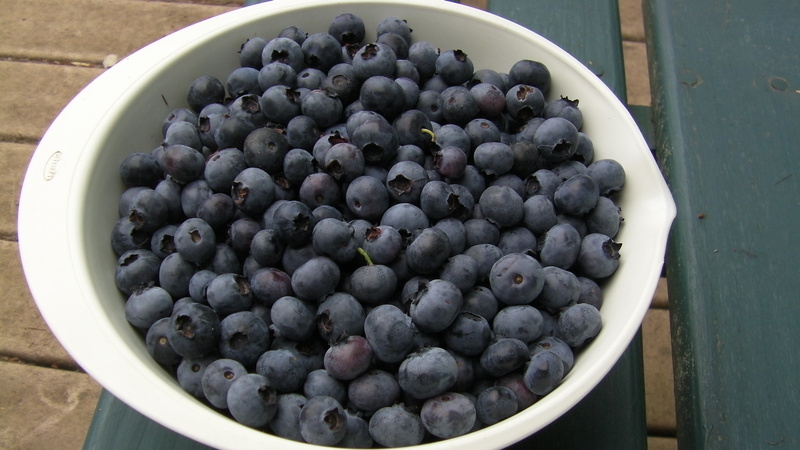 The blueberries are now ripe and ready to pick. Thanks to the comfrey for hiding the blueberries from the birds, we can now pick them. The bumblebees are still pollinating the comfrey even though it’s been over two months. These blueberries were picked today. This is probably our best harvest yet. We’ve been getting this much every couple of days. It’s been a successful experiment. The comfrey might compete somewhat with the blueberries for water and space…but what matters most is the successful harvest before the birds get them. 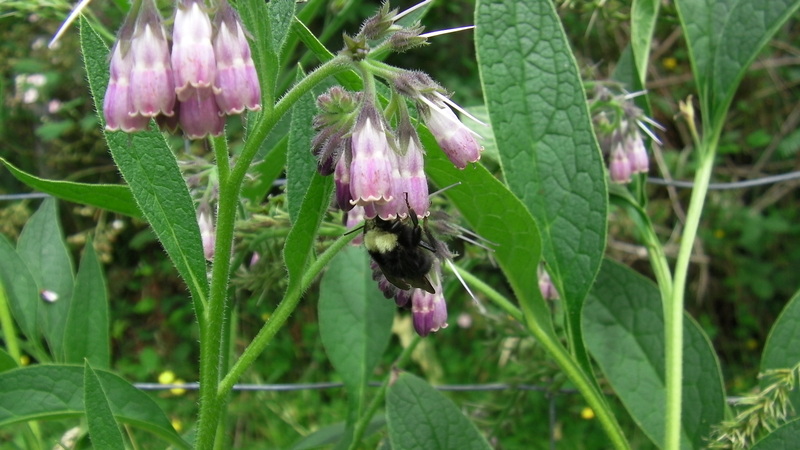 As a win-win, comfrey is known for it’s healing qualities also. For growing and using comfrey see this article by The Mother Earth News. 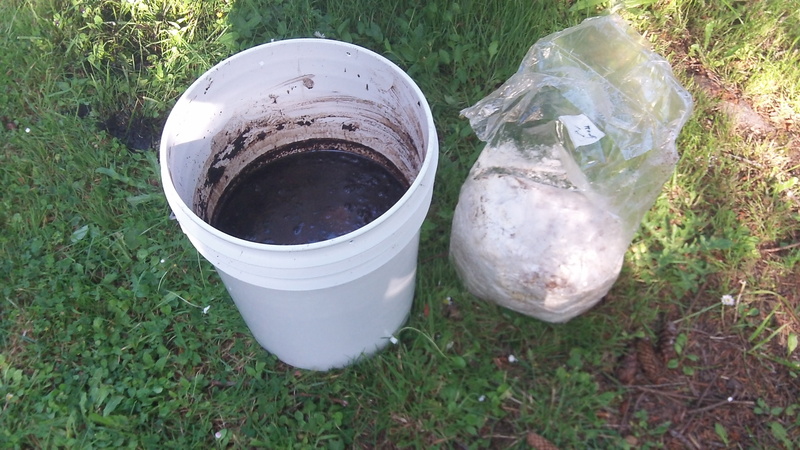 And here’s a another person’s story of how to make a poultice and apply it. I just came across yet another site about the great qualities of comfrey. This short video shows the progress of the swarm that was transferred from the bait hive to Bee Beard on June 2nd. Now after 7 weeks, viewing through the observation window, you can see the bottom of the bee cluster is below the level of the mouth entrance. Initially, bee beard would face southwest into the winter wind. For that reason, an alternate entrance was drilled towards the north rear. When we decided to locate Bee Beard facing east, that alternate entrance was plugged with tissue paper. To my surprise, the bees have just pulled out that tissue paper and you can see a bee flying out with a bit. In the slightly out of focus video through the observation window, you can see bees carrying out bits of paper. Also seen are bees carrying pollen from blackberries and St. John’s Wort…my bees won’t suffer from depression! 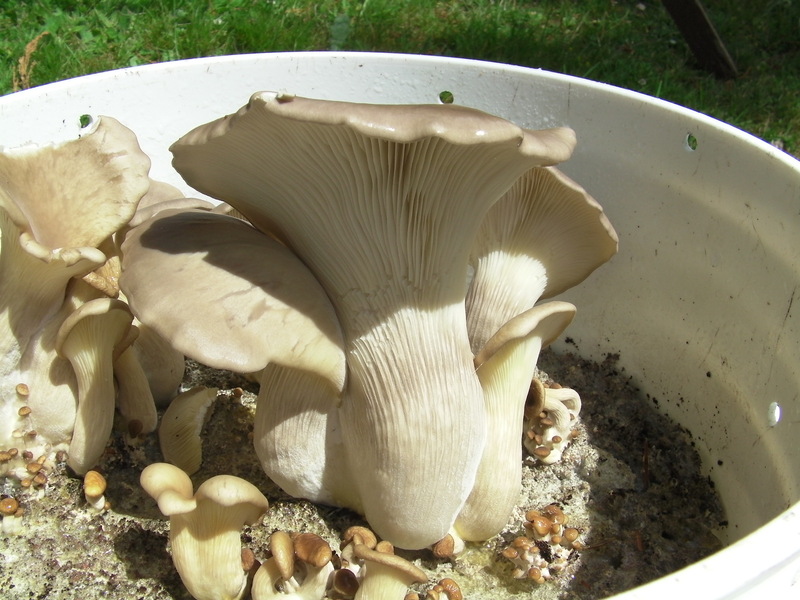 I decided to try out growing some mushrooms after my daughter sent me a mushroom growing kit from the SF Bay area. 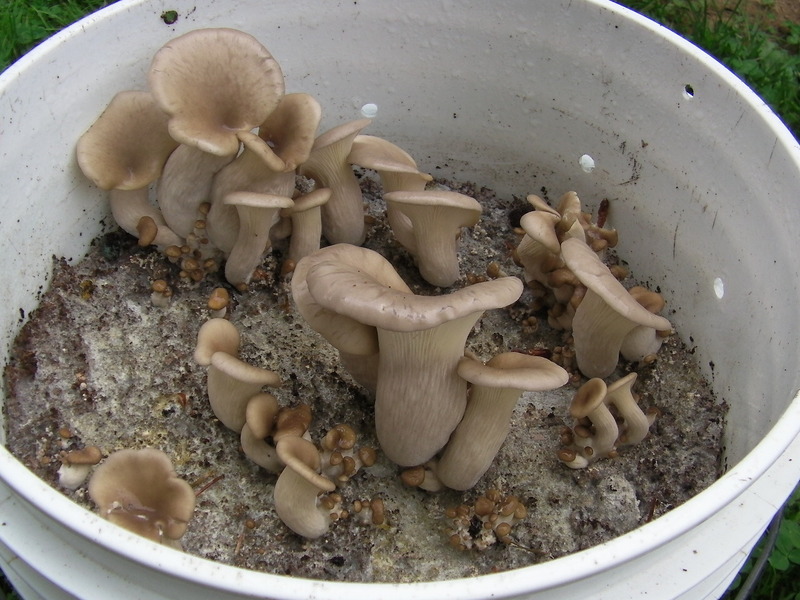 They were oyster mushrooms and worked well, so I wanted more. 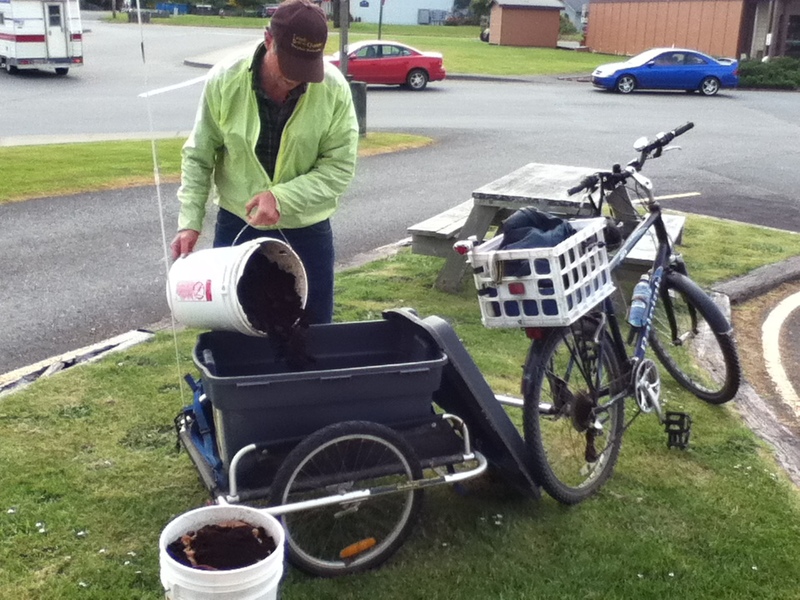 I trade printing services for the opportunity to pick up coffee grounds from a place in town. 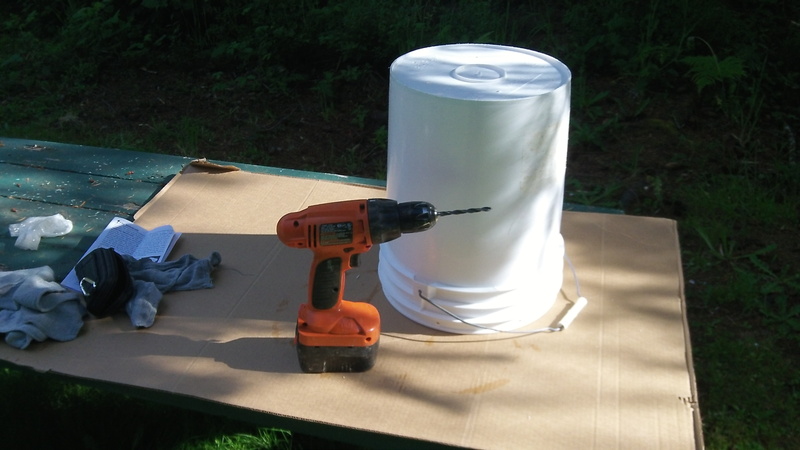 I only needed about a five gallon bucket load. Since we are adamant about having as many car-free days as possible, I try to use the bicycle as much as possible. Two full buckets…that’s heavy. I hope the wind is at my back on the uphill stage. The whitish spawn comes in a package. All mixed up and ready to wait. It takes about 3 weeks to start showing. 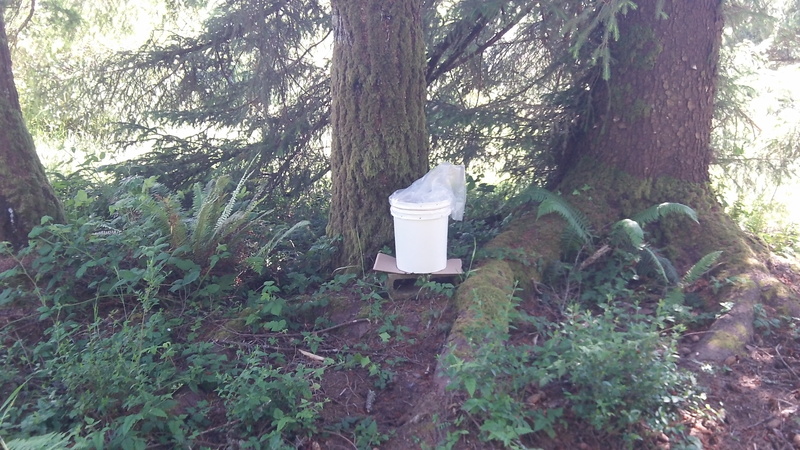 I placed the bucket outside under some fir trees. It’s mostly in the shade with a couple of slices of sun early and late. 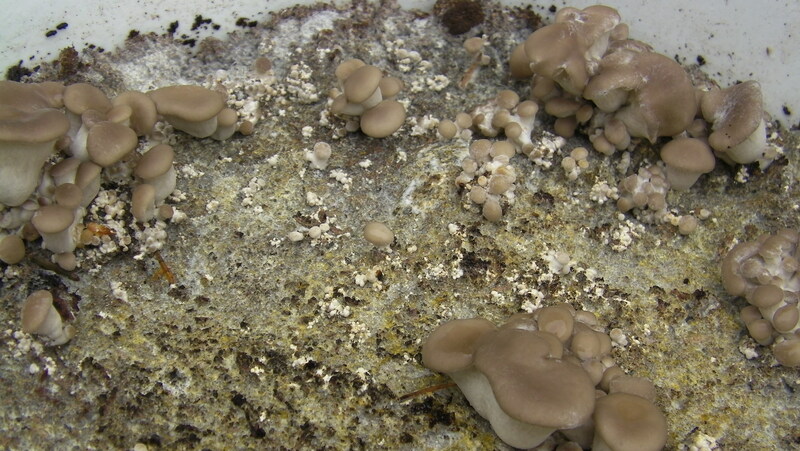 Day 18…whitish color on surface of mixture. oh boy, it’s going to happen! Day 25 Ain’t they cute? They are growing at Day 28. Soon we will cut just a little to try out. The directions say that 1-2% of the population is somewhat allergic. If you eat just a little and get a reaction, it’s better than eating a bunch. 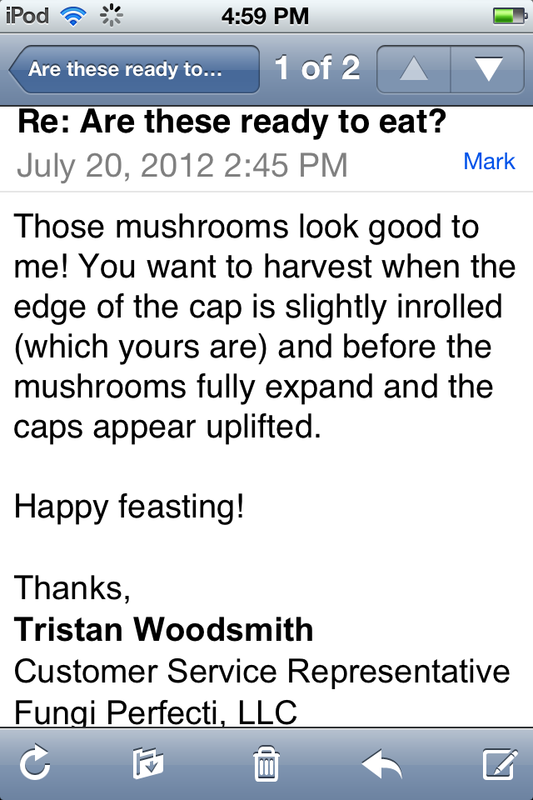 Just to be sure they were ready, I inquired about the mushrooms. Day 30…Harvest time. I wish I could say I ate a small sample to test it out, but I couldn’t hold myself back and ate the whole batch! 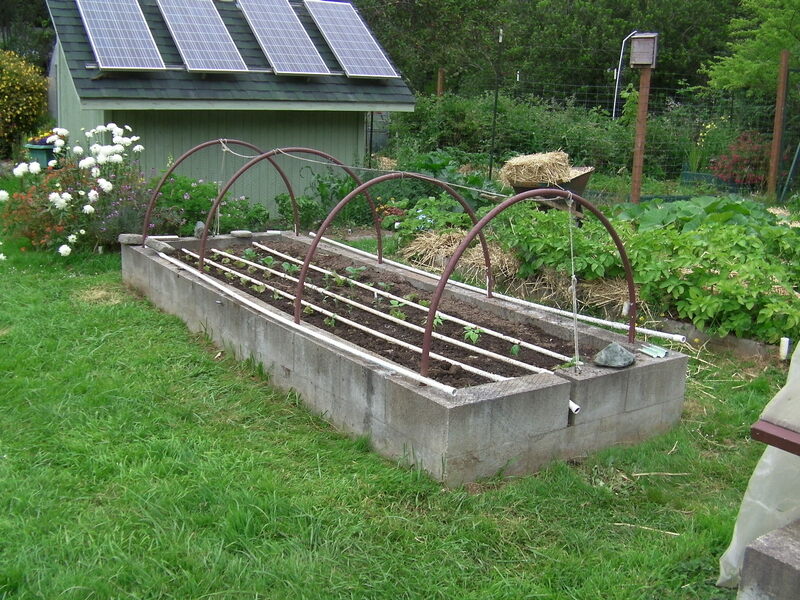 This raised bed was planted in late March. 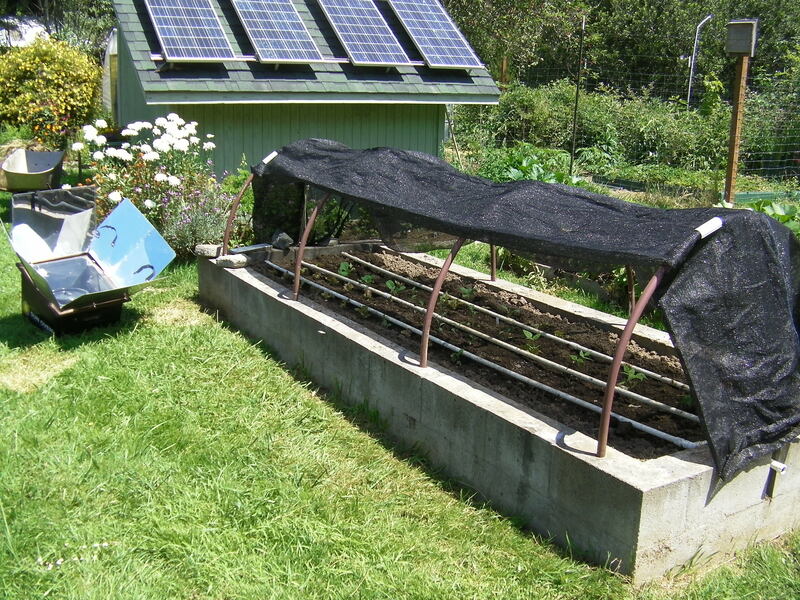 It’s time to harvest the lettuce and cabbages, add soil amenities, and replant. 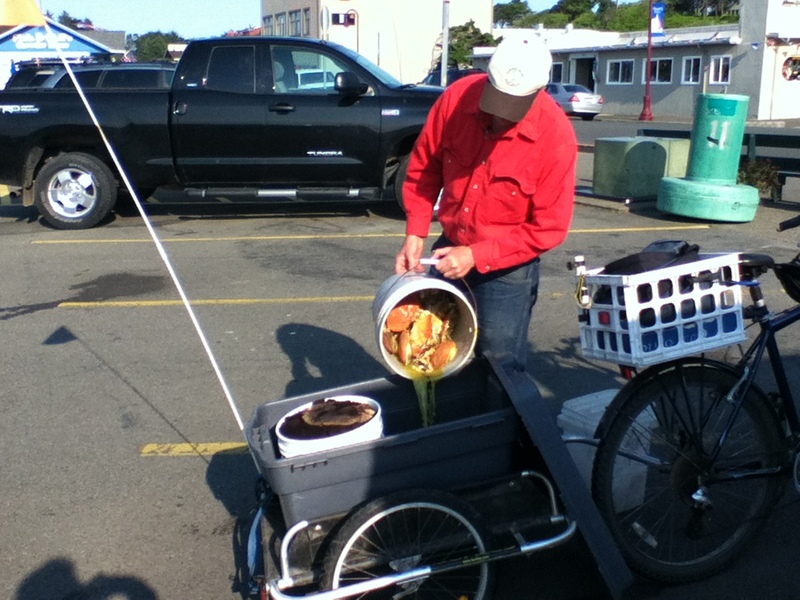 We try to keep the use of a car to a minimum so today we’re getting the crab shell and coffee grounds using the bicycle and trailer. We like to use whatever is naturally available. 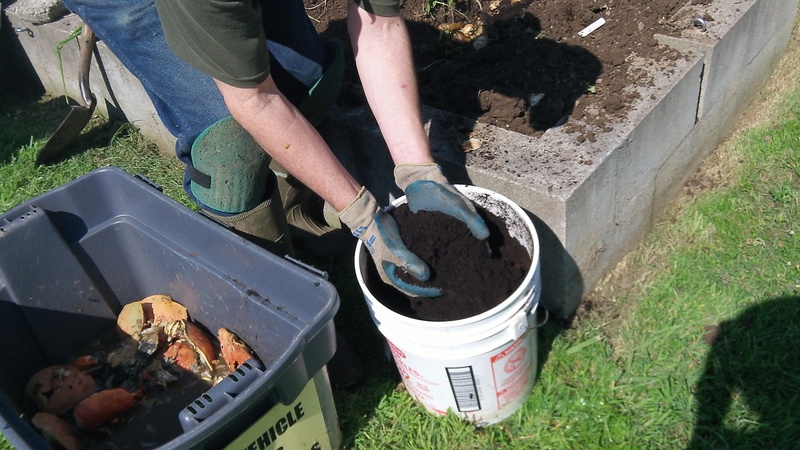 We’ll use coffee grounds, crab shell, kitchen garbage, leaves when available (in the fall) and garden trimmings. 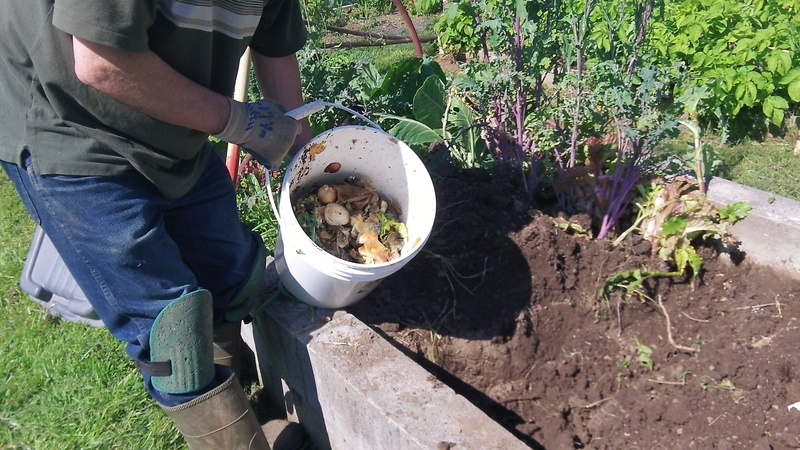 Kitchen garbage is a surprising source of nitrogen for the soil. Fresh crab shell gets chopped up. The soft parts will decompose by the time the roots reach it. 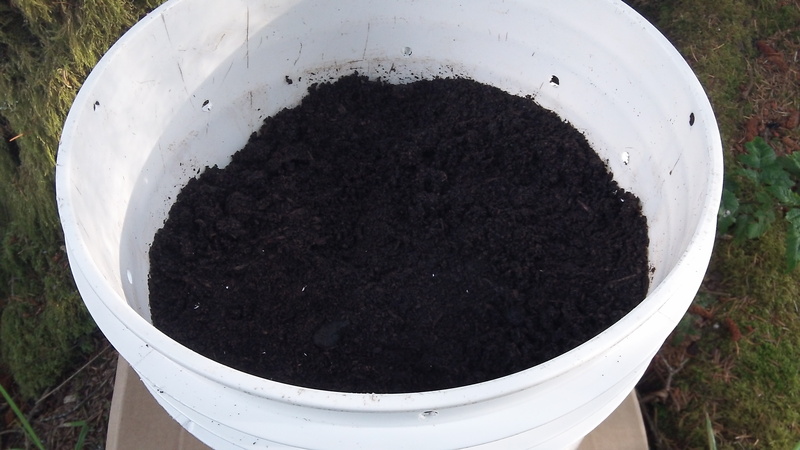 I’ll be planting this within 3 days…can’t waste any time. 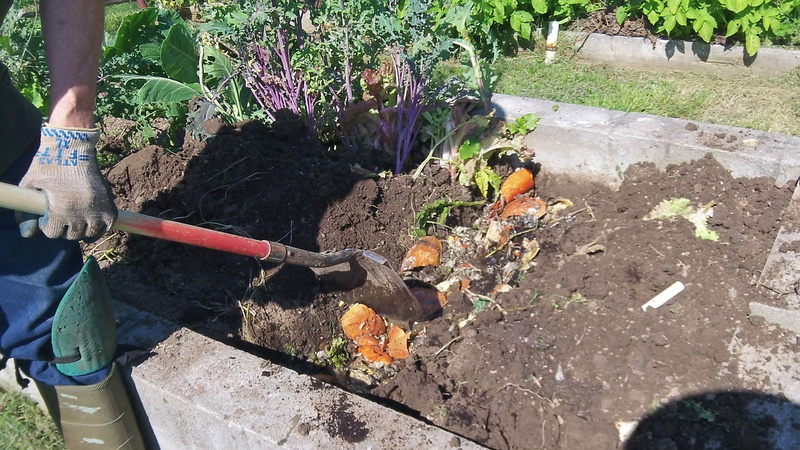 I’ve tried adding fresh crab shell to the compost pile…DON’T DO IT!!! It stinks for days. 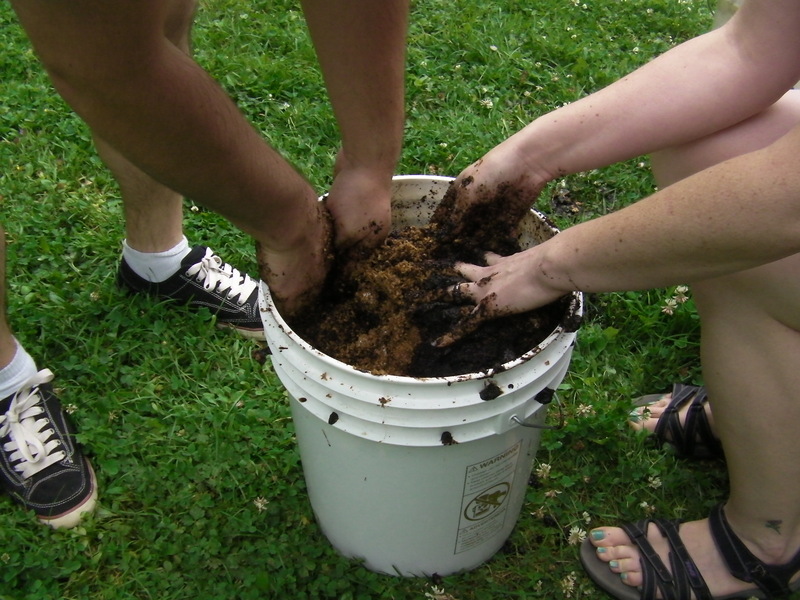 If you bury it, you won’t smell it, and you’ll be surprised by how fast the microorganisms in the soil will break it down. Just keep the dogs out of it. 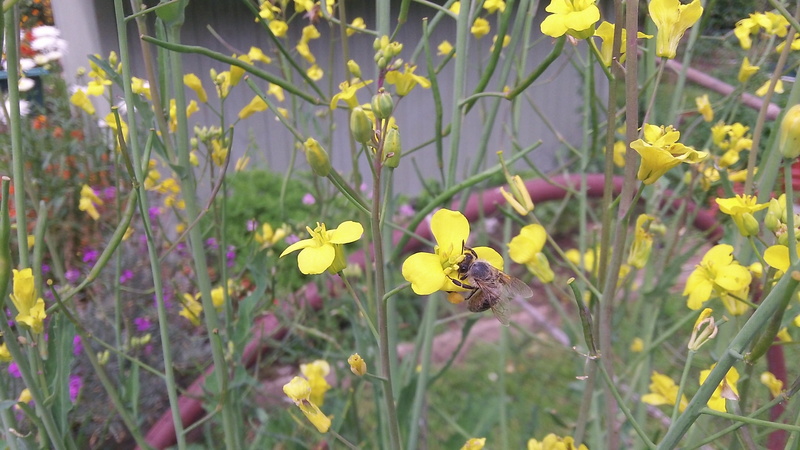 I hate pulling out the kale flowers that the bees love so much, but if I don’t, the deer will get under the netting and eat up my little transplants. I’ll hang it upside down in the greenhouse and save the seed. I can’t believe I actually needed the shade cloth, but the little transplants were wilting…it serves a dual purpose in preventing (I hope) the deer from investigating. The old netting got tangled in the kale and had to be cut away. We started working on this bed 5 days before we planted. 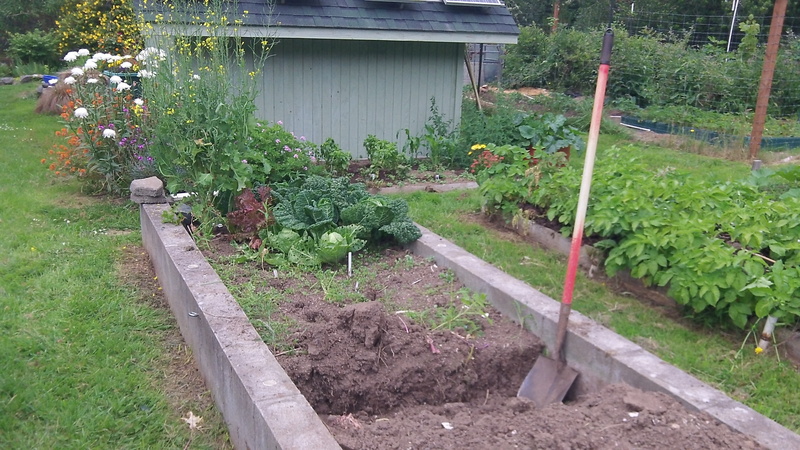 That may seem like we’re not leaving enough time for the scraps to break down, but there are 4 to 5 inches (10 to 12 cm) of soil and we figure by the time the roots get down there, it will be decomposed enough. We’ve done it many times and it seems to work well. The worms love it. 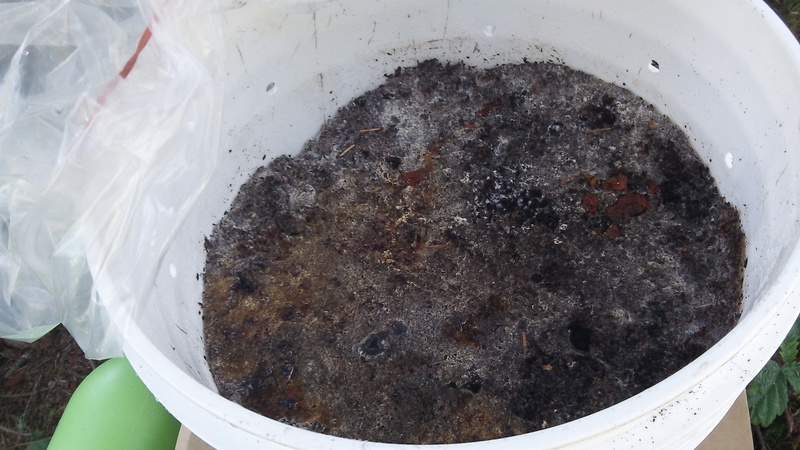 Tap into this web site for more info on the use of coffee grounds in the garden. Hey…not so fast, you guys. 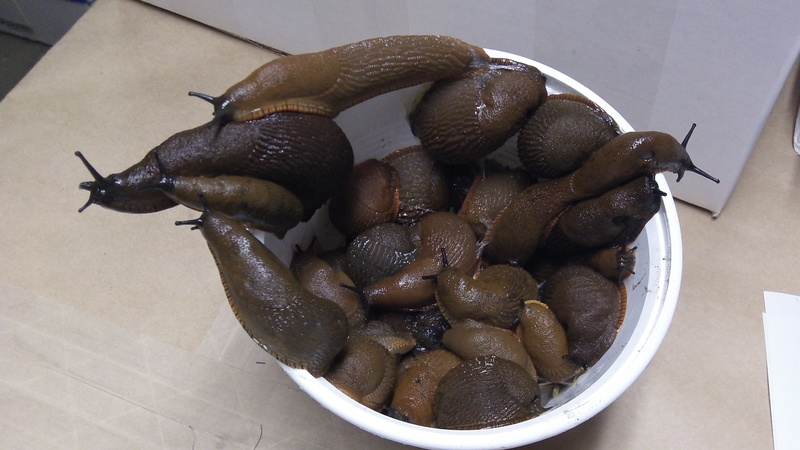 Every night 30 to 50 new offenders enroll in the SLUG REHAB program. The first night is a ‘drying out’ process. We take them off their favorite foods…cabbages, collards, marigolds and especially bee-loving plants like sunflowers, wall flowers, daisies, and salvia. We dump them in the woods where they can feast on pine needles. Repeat offenders spend a night in the ‘slammer’ (freezer) where it’s guaranteed they won’t be back…and we don’t waste any beer on them. Come on kid, we’re out of here. Note: No slugs were harmed in the making of this blog.